Joseph Smith taught that after coming to an understanding of the nature, character, and attributes of God, it was then necessary to understand the knowledge that a person must have in order to obtain eternal life in God's presence. This knowledge, taught Joseph, was necessary "in order that they may be enabled to exercise faith in him unto life and salvation . . . An actual knowledge to any person, that the course of life which he pursues is according to the will of God, is essentially necessary to enable him to have that confidence in God without which no person can obtain eternal life” (Lectures on Faith 6:1-2). When we come to earth as a new born baby, the veil is placed over our memory, and we do not remember who we are. We have no recollection of where we came from or just how far we have come in our progression towards eternal life. If we could catch a glimpse of who we really are, I am sure we would be amazed at how far we progressed in the pre-existence. The Father, and his eldest Son Jehovah, felt we had progressed enough that we were ready to experience life on an earth--a life without memory, with a physical body with weaknesses and a natural desire towards sin. What great faith they must have in us to trust us with this experience. Knowing that we would indeed give in to the natural man and the temptations of Lucifer, the Father's plan for this earth included a Savior who would suffer for our sins, die, and be resurrected for us. We shouted with joy when Jehovah offered himself to be our Savior. What great love he has for us, and what great love we must return to him. On earth, without memory of our previous life, Satan wants us to feel worthless and unworthy. He constantly whispers discouragement through thoughts to our minds and the words of unenlightened individuals who harass and pressure us. The very fact that we have been born on earth should tell us of our value and worthiness. Satan will never have a body because of his choices, and therefore, each of us living on this earth is more worthy, of more value, and with more potential than Satan will ever possess. By understanding how we came to be born on earth should comfort us with the knowledge that we are well along the path to eternal life. The key to continuing on the path is the same for each of us. Because we are all fallen, natural men and women, we must turn to him who can save us, Jesus Christ, and repent constantly for mistakes made and opportunities missed. We must always ask ourselves, am I on course? Am I on the path chosen before I was born? Is Father pleased with my progress? Am I humble enough to accept the gift Jesus has provided me? Is my heart filled with the love of Christ? Are my actions in accordance with one who trusts in Christ and desires eternal life in his presence? 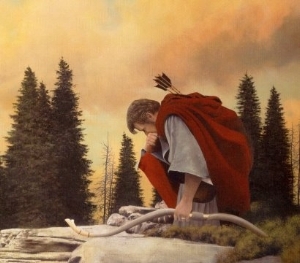 The Prophet Joseph set the example, by trusting the testimony of James that God would give him wisdom and answer his prayer, he separated himself from the world and went to a grove to pray, desiring to learn how to obtain forgiveness for his sins and which church could provide the much desired salvation. And again, when desiring to know his standing before God, having once before obtained an answer, he prayed and the Angel Moroni appeared to him. While Joseph was not perfect and had his flaws as do all men, he obtained the faith necessary to obtain answers to his prayers. The Book of Mormon Prophet Enos is one of the greatest teachers of faith and providers of evidence that God will speak to man, adding to the witness of James, Joseph Smith, Nephi, and his father Jacob. Enos was raised in the righteous home of Jacob, the son of Lehi. We don’t know about his mother, but we can surely see her teachings in the life of her son. The charity shown by Enos towards others along with the his knowledge of doctrine are sure signs of the influence and teachings of his righteous parents. Scholars have pointed that Enos had a more optimistic personality than Nephi as Enos lists “nurture” before “admonition” in his introduction, unlike Nephi who mentions “many afflictions” before being “highly favored of the Lord” (1 Nephi 1:1). While being in the same family and tradition of his uncle, Nephi, he shows he is not a carbon copy of his “fathers,” but has his own story to share with us, his own “wrestle” before God. Enos was at a pivotal time in his life. His father, Jacob, had chosen and set him apart to be the record keeper and spiritual leader of the people of Nephi. Obviously Enos was a righteous, faithful priesthood holder or his father would not have chosen himself for such an important position. However, as with all righteous people who are called to a new position of leadership, Enos was unsure of his abilities and worthiness. He needed the knowledge that "the course of life which he pursues is according to the will of God." If so, he would then be able to faithfully perform the duties of his calling. His desire became so great that it was as if he had a "wrestle . . . before God" (Enos 1:2) as he separated himself from the world around him and went into the forest to pray. He surely missed his father and the strength and example he had been. His father's words "concerning eternal life, and the joy of the saints, sunk deep into" (Enos 1:3) his heart. As with the boy Joseph Smith, his desire became a hunger, and he fell to his knees and "cried unto [the Lord] in mighty prayer and supplication for mine own soul" (Enos 1:4). His hunger remained unfed for hours as he pled with heaven to answer his questions of worthiness. He wanted to know if he was on course, if he really mattered. He wanted to know if the Lord loved him, cared for him, and if he could fill his father's place among the people. He wanted to know for himself what his father and uncle knew. He wanted a personal testimony of the Savior, a personal testimony the teachings of his father about obtaining eternal life were true. He desired knowledge, the knowledge and assurance that comes to someone who knows God and that he is saved in God’s kingdom. In humble prayer, kneeling before his Maker, tears were shed as his desire grew with each moment. Finally, after a true soul-searching time in prayer, his mind was filled with peace and light, and a voice quietly came to his mind, "Enos, thy sins are forgiven thee, and thou shalt be blessed" (Enos 1:5). His faith was strengthened as he "knew that God could not lie" or he would cease to be God, "wherefore, my guilt was swept away" (Enos 1:6). In one simple moment, and through a simple phrase, Enos learned of God's love for him personally, that he was on the path laid for him to follow, and that the Lord would always be with him, that he would be blessed with the wholeness that is eternal. In amazement, with a desire for confirmation of the teachings of his father, Enos said, "Lord, how is it done?" (Enos 1:7). Again, with the calm of omniscience, the Lord replied, "Because of thy faith in Christ . . . wherefore, go to, thy faith hath made thee whole" (Enos 1:8). His faith has become knowledge, his assurance of being whole, or complete, becomes his personal assurance that the teachings of his father, and other prophets, is true. Jesus is the Savior of the world and has made it possible to return and live with Him. He now knew the course of his life was according to the will of God, thus his faith began to be unshaken in the Lord. Immediately Enos was filled with the love of God and charity for his fellow men. By coming to understand his place on the path to the tree of life, he reached out, as did his grandfather Lehi in his great vision, to others, desiring for them what he had experienced. Today, his charity continues to reach through generations of time to us today, instilling in us a desire to follow his example before the Lord in obtaining the faith necessary to obtain eternal life and have charity for our fellowmen. Through the power of the Spirit, each of us can follow the counsel of Enos in going before the Lord to learn for ourselves if "the course of life which [they] pursues is according to the will of God." We may obtain Priesthood blessings that may encourage and assure us we are one the path to return to be with our Heavenly Parents. I testify that if our desires are great enough, if we hunger and thirst for this knowledge, we shall be fed. We can each personally have quietly come to our minds the sweet words of our Savior, "thy sins are forgiven thee, and thou shalt be blessed." Our faith will join with Enos, Joseph Smith, Nephi, and others, in becoming unshakable, and our hearts will be filled with the love of God. May each of us strive for the understanding that "the course of life which he pursues is according to the will of God," that we might learn through the Spirit's power the love our Father and Savior have for us. May we be filled with charity, and the faith necessary to obtain eternal life as did Enos. And, may our faith lift us to be more like him who made eternal life a reality--even Jesus Christ. 10” Christus Statue Click Here!